This next section introduces and discusses the main types of assets used by investors to store and transfer wealth across states (possible outcomes) and time. As we know, investors face a huge array of choices of assets, each with its own risk and expected return. Check out this graph showing the annual returns to various asset types. Note, these returns are adjusted for inflation (the return to a dollar is negative) and the vertical scale is logarithmic, meaning the differences would appear substantially larger using a regular scale. Later in the course we will talk about building portfolios of assets and asset allocation. Assets also vary in many other ways including price, liquidity, ease of transfer, contractual rights and obligations and tax treatment, just to name a few. The topics to follow in Section 3 are introductions, not comprehensive guides. The first category of asset we consider is debt, or bonds. Part I – What are bonds? ~ A term, which is the period of time before the principal has to be repaid. This can vary from one year to 30 years, or longer. 3. While the coupon rate of a bond is fixed, the yield is the return on the bond. The simple yield is the current coupon divided by the current price (more below.) The yield to maturity can also be calculated and varies depending on the current market price and the time to maturity. It is essentially the internal rate of return of the bond. 4. Bonds are generally lower risk than equities, and give the lender a favored legal standing if the company goes bankrupt ahead of other creditors, in particular shareholders. a) interest rate risk – as the interest rate varies, the value of a fixed-coupon bond varies. More on this below. b) call risk – the risk that the issuer pays off the principle before the maturity date, so not paying all the scheduled interest payments. c) inflation risk – higher inflation lowers the real rate of return (real yield) to all assets, but bonds have a fixed face value. d) default risk – the risk that the bond issuer will default on interest payments or repaying the principle. e) liquidity risk – bond markets can have few buyers and sellers, and those wishing to sell bonds may have difficulty finding buyers, which produces a “thin” market. Scroll down on this Wikipedia page to the section Types just to see how many different types of bonds there are! Money market instruments are generally not considered bonds. 1. Issued by companies, both public and private, to raise capital to purchase assets. 3. Usually sold by syndicate of securities firms and banks who buy the entire issue and sell directly to investors. 4. Generally more risky than government bonds. 1. Issued by the Federal Government called Treasuries, State and Local Governments called Munis. 3. Usually sold by auction. 5) Interest on US savings bonds is tax deductible, as is interest on Municipal bonds. 1. Because bonds are generally negotiable securities, they can be bought and sold on a bond market. Unlike stock markets which tend to be actual physical, or virtually physical, places (New York Stock Exchange for example), bonds are traded by dealers in over-the-counter markets. Remember that a market is an institution (a set of rules for trading or exchanging) rather than a physical thing, so it’s acceptable to call the bond market a market. 2. Bond prices are determined by the demand for, and supply of, bonds. After one year and a day, the general interest rate in the economy rises to 8% and new bonds are issued at that rate: Bond B has face value $1000, 10 years to maturity and pays $80 per year in interest. Although many factors determine the rate at which bonds must be offered to attract buyers (including the riskiness of the company issuing the bond,) coupon rates generally follow the economy-wide interest rates. I calculate the clean price to be about $811, based on the yield to maturity of A compared to B. The example shows that the price (value) of a bond falls as the interest rate rises. The converse is true–a fall in the interest rate will increase the value of a bond. 4. This result highlights one very general feature of bonds, and securities in general: investors make money if prices or values change. It is the change in price/value that matters, not the level of prices. 5. If a bond is currently selling at a price above par (face value) it is said to be selling at a premium. If below, at a discount. 6. Some bonds don’t pay interest, and sell at a discount on issue. They return the face value on maturity, so the increase in value over time is an equivalent return to the interest not paid. Both Government and corporate debt is issued for various terms ranging from 90 days to 30 years. Each type of bill/note/bond has a yield associated with it. That yield changes daily, and is calculated that frequently. (Check out this video of monthly changes in the yield curve since 2002.) The US Treasury Dept publishes the yield curve data on its website here. These data for Government securities can be plotted with the yield on the vertical axis and debt term on the horizontal axis. The yield curve has both a shape and a location. This means that it moves up and down between higher and lower yields, as well as shows a difference between the yields of short term and long term bonds. Normally the higher the level of inflation, and inflation expectations, the higher the overall yields will be. Also, normally, the yields on long term bonds will be greater than the yields on short term bonds. The yield curve will be up-sloping. Sometimes, as displayed in the dynamic yield curve demonstration, the yield curve becomes inverted, and long term bond yields are lower than short term bond yields. This is usually interpreted as reflecting concern among bond investors that an economic downturn, or recession, is impending. In recent years the yield on bonds has fallen, to the point that some government bonds, and corporate bonds have negative yields. A negative yield means that rather than paying to borrow money, companies are being paid by lenders to borrow money. This (almost) defies logic, yet the explanation lies in a comparison of these bonds to the alternatives. If an investor is looking for the least risky option, a bond that pays a negative return might be more attractive than a more risky investment paying a slightly higher, and positive, return. Still, the world appears to have reached a stage where investors can’t give away money… This article from the Financial Times is very informative. 1. Investopedia’s introduction to bonds. 5. 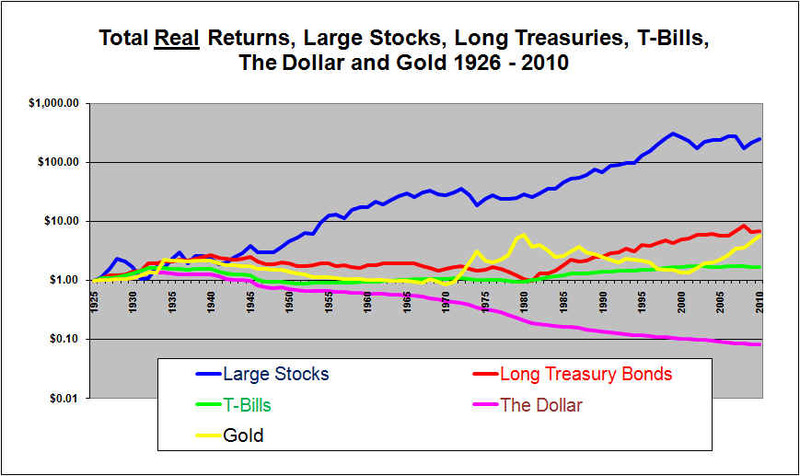 Here is an interesting article about really long-term (118 year) returns to various assets. 1. After watching the dynamic yield curve video, consider these questions: Why would the “normal” yield curve be upsloping – meaning shorter term debt offers lower returns than longer term debt? Why would it ever be reversed? 2. Read the Financial Times article about negative bond yields. Why would any investor accept a negative return? 3. Read this article from The Economist about quantitative easing. The US, and many other countries used QE actively for many years following the recession of 2008. Do you think it’s a good idea, and did it achieve the goals of the policy?